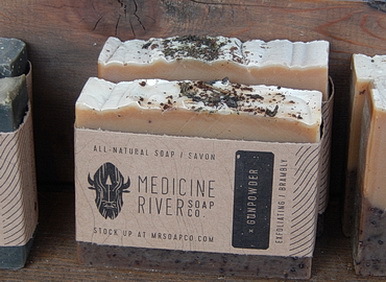 A sign of an entrenched native prairie animal icon, is a hulking, ugly bison stamped into Alberta handmade soap. Not that I’ve seen a salmon icon on Pacific coast local soap –yet. Pacific coastal soapmakers might find dolphins and whales more romantic iconography for beauty soap products. 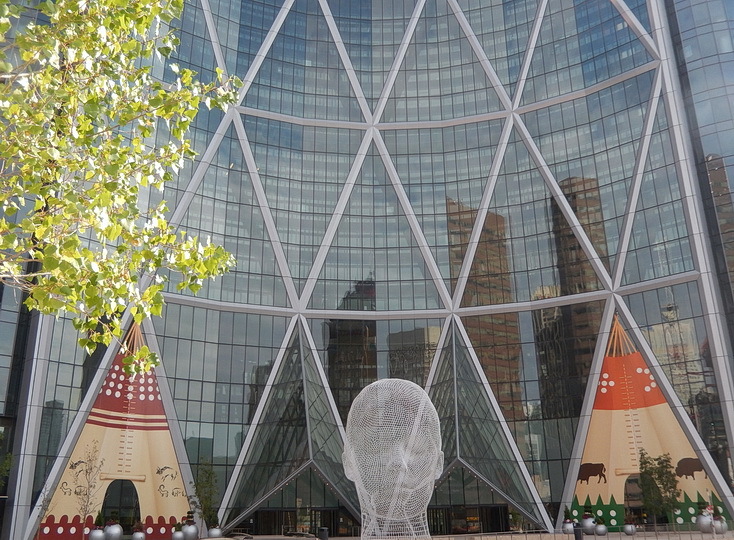 Office building entrances of Bow Building transformed artfully with tipis and bison imagery during Calgary Stampede 2015. Photo by J.Chong. Local history art depicts bison as part of Plains Indian culture. Medicine Hat, Alberta 2017. Over 280 km. east of Calgary. Photo by J. Chong. While the bison isn’t cuddly nor evokes an awestruck “wow” like the soaring bald eagle, the bison’s klutzy but vaguely threatening, massive brown bulk just makes you pause a tad. It’s a creature you tend to learn tidbits of its cultural influence on the Plain Indians for several thousand years and now, on local art and local branding. Bison brand has nothing to do with the tea –except it was packaged in Alberta, home of wild bison. Photo by J.Chong 2017. 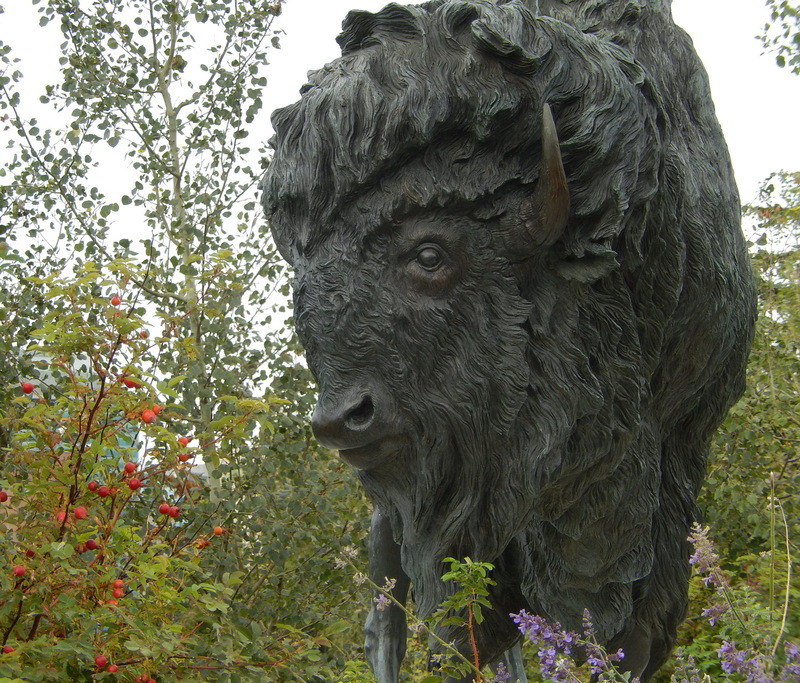 If the bison wasn’t around, eventually, this prairie animal icon would be missed. For most locals and tourists, it’s finding bison redemption in its clumsy furriness. I’ve already blogged earlier about bison as local prairies’ signature food where it is in farmed in abundance with highest quality because of its foraging on dry, grassy rangeland. But unlike horses, a domesticated animal, loved by many in the Canadian prairies, bison is always wild and dangerous, even if farmed. It can even run up to 45-55 km. per hr. Bison have poor eyesight like cattle (fact from Jack, the ex-farmer), but have a good sense of smell. Alberta handmade soap with bison company logo. Gunpowder probably a natural exfoliating powder. Bison or buffalo (not be confused with water buffalo), always tends to be in art, as solo against Man or just standing around in a herd or solo munching on grass. Man is always far away or there’s a fence or natural barrier between Man and bison. You never see any art depictions of anyone petting or riding a bison. No one, not even the Plains Indians, were dumb enough to do such dangerous thing. slightly romanticized drawings of Indians chasing a few frightened bison galloping away. Only recently I was shown a herd of buffalo sculptures not far from home. It wasn’t noticeable to me since I was always whizzing along, on the look-out for cars whizzing by me. All these images are good for the solid bison that lumbers mysteriously across our land. I’m not even sure what type of noises bison make. Maybe one day I’ll hear it from these glowering but solid creatures..
Chong, J. Roaming Around for Bison: Distinctly North American Lean and Maybe Gourmet. In Cycle Write. Dec. 17, 2010. 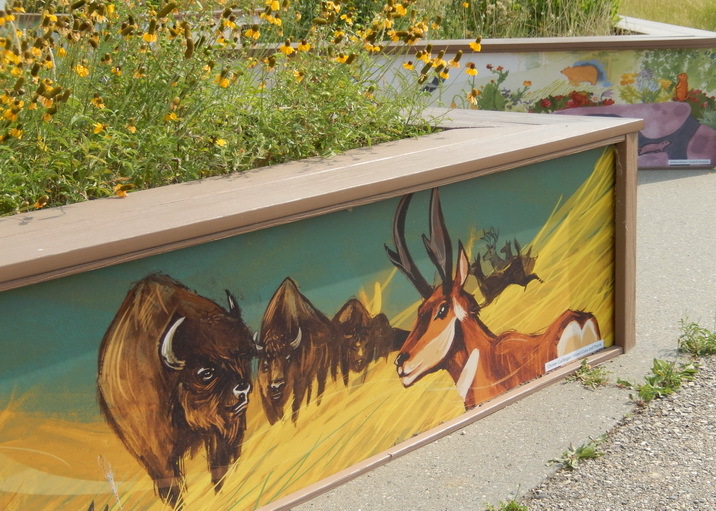 Bison art graces utility box near Rideau bike-pedestrian bridge by Elbow River. Artwork by Solomon Bandi. Calgary, AB 2016. Photo by J.Chong. They are truly magnificent animals, aren’t they? In their own way, they certainly are. It took time to collect examples of art….about this creature revered by the Plains Indians. Until I lived in the prairies, I never really paid attention to bison. There are small farmed herds in southern Ontario (where I was for first 40 yrs.) and Quebec. Alberta has a lot of grassy ranchland –their natural habitat of huge distances with tons of grass and space to wander. They also adjust well to our harder winters. Hope the featured art gives highlights some cultural and artistic influences of bison. In Alberta, the largest wild herd is in Elk Island National Park..not far from Edmonton. The Canadian govn’t did dontate several hundred to Glacier National Park in Montana to restart a wild herd. There is also a UNESCO Heritage natural site in central Alberta, Smashed-Head-Buffalo-Jump where the Indians did as a matter of hunting, run a herd of them over the cliffs..to have them for food, shelter and clothing. It’s an archaeological sight worth visiting. Great way to connect the story of this mighty prairie animal with the art! I really liked your photos. Never knew Bison had a place in Canadian art. Fascinating that it’s something to be admired, preserved and also consumed. If they tend to be wild, then maybe it’s best to keep your distance but maybe some are tamer than others. Never seen them here in Australia, and maybe they are the kind of animal that prefer colder climate. Yes, they really prefer cold climate. But can take a few summers of dry heat up to 30 degrees C.
I’m sure one day you might if you haven’t already, choose the iconic kangaroo or kola bear or whatever Aussie creature. And Aussieland has enough of unusual creatures that must have inspired art over the centuries. Jean what a great collection of bison art! We enjoyed our time at Elk Island National Park and learning more about bison. Shortly after some of those bison were transported to Banff National Park. Amazing animals and I am so pleased to learn more about them here. Hi Sue: We went to Elk Island Park 2 yrs. ago for 2 hrs. during the day. Unfortunately didn’t see bison until we just drove out of the park and in flash, saw some bison drinking from the pond. We have seen them at Waterton National Park. Wow, I didn’t realize bison was such an art figure. The one on the wall is beautiful. I’ll be sharing this post with T, as he’s on early American (antiIndian) history right now. I’m sure you’ll inform your son on history perspectives. Wow. I love bison art, which You presented here. They are awesome. I see bison only in zoos. Thank You for this very inspiring post. Have a good day! Is there wild muskox in Finland? We have muskox only in the Arctic or our zoos.